A rope jumping workout is an excellent way to burn calories, furthermore, it works your coordination and speed. But to increase speed when rope jumping is not as easy as it may seem at first glance, or when we watch how professionals jump, as our friend Adrienn Bánhegyi. “Fame has a price, and here is where you will begin paying, with sweat”. A study from the Cooper Aerobic Institute revealed that rope jumping is one of the best and faster methods to burn calories and improve fitness. The research stated that 10 consecutive minutes of rope jumping are equivalent to running 30 minutes at a comfortable pace. If you wish to see in your own physique how is it possible to increase your speed by jumping with a rope, you must first, naturally, learn the correct jumping technique, and then you must pay attention and practice the following seven exercises we will show you in this article. At the end, you will also find a specific workout meant to help you put into action everything we are going to explain. Why do you want to increase your rope jumping speed? If your objective is set, it gets easier to attain it. The best and fastest rope jumpers in the world jump around 3-4 times per second. Have you ever measured how many do you do? Are you close or far away from the top names in this discipline? In last year’s World Jump Rope Championships in Hong Kong, China’s Zhongfei Duan established a new world record with 105 jumps in 30 seconds. This year, he as already been surpassed by another Chinese jumper of only 11 years old, named Cen Xiaolin, who set the new record in 108 jumps in 30 seconds. So that you can get an idea of what a skipping or rope speed jumping competition is, you can watch the most recent record in the video below. 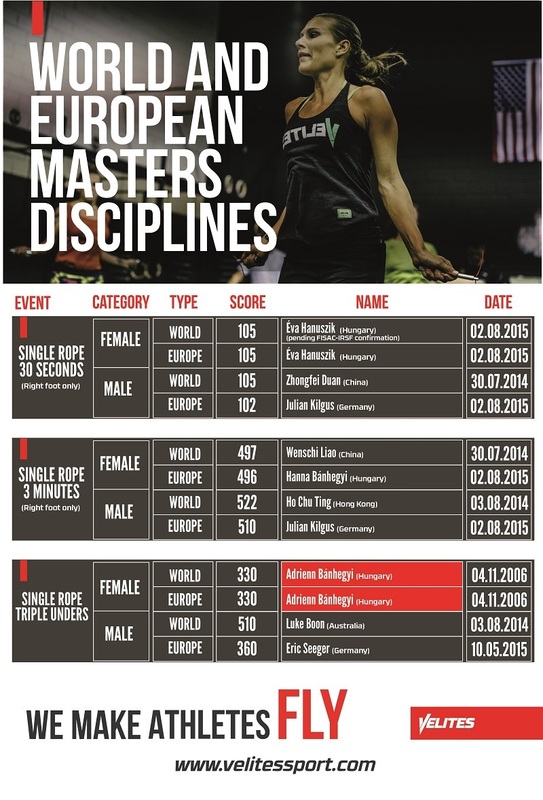 Additionally, we leave you here the official classification, with the records in some of the categories featured in the European Rope Skipping Organization competitions. In the updated classification of the organization, which is yet to be updated with the last record that overcame the one by Zhongfei Duan, you will also be able to see that our friend and Velites Sport, Adrienn Bánhegyi, is the European and World Champion in the Triple Jumps category. Although it will be hard for you to get to the levels shown by Zhongfei, Cen Xiaolin or Adrienn, surely that, with discipline and training, you may dramatically improve your actual speed. Obviously, having good tools also plays an enormous part in achieving your objectives, and, in this case, having a good rope, both for training (VRope Earth) and for competition (VRope Fire 2.0) is paramount. Supposing you have good tools and a great will to train, let's define 7 exercises that will allow you to rope jump. Naturally, we have got to start with a basic jump, firstly because it is the first step if you are beginning, and secondly because it will be used as a reference for tracking your progression. Hence, the basic jump is the starting point. Count the amount of jumps you can do in a minute and right it down on your phone or on your computer. That shall be your starting point from which to measure your progress. Additionally, the basic jumps will work as a warm-up before performing other more challenging jumps. This type of rope jump is similar to the previous one, with the exception that on this jump you will be moving both your feet from one side to the other. Opposite to the previous type of jump, where you always land on the same place, on this jump you vary the landing place from one jump to the other. With a hip movement your feet will simply go from left to right. This specific variation will help you improve your lateral jumping skills, and besides increasing your speed, you will also better the stability of your jumps. In this jump variation you will begin with one foot slightly ahead of the other. With every jump you will alternate the foot that is in front, switching from the left to the right one and vice-versa. You should achieve an alternating movement of your feet each time the rope passes under your body. This jump will help you improve your dexterity, agility, and, most of all, your coordination, key skills to improve your speed when rope jumping. This variation is similar to the one on point 3, but this time you will perform it by adding a lateral movement. As on jumps 1. and 2., in this case you have the same exercise as in 3., but you add to it a movement from left to right. This jump adds on a destabilizing element that will enable you to improve your flexibility and stability when jumping. In this variation you will have to alternately jump with one foot and then the other in the same rope passage. It is like climbing a flight of stairs but while jumping with a rope, and trying to reach your knees as high as possible. This exercise is perfect to increase your elasticity and speed. It is also important to begin slowly, performing few repetitions, and, above all, to get a good warm-up before starting. It is an exercise that stresses the joints more because you will be performing the jump with just one leg at a time. Therefore, the number of repetitions in this variation should be controlled and you should not push too hard. Keeping one knee up, it is all about performing jumps with the other leg. It is a tricky jump at the begging because it will require much balance and some dexterity. Moreover, it is a type of jump that stresses a lot the leg that is repeatedly jumping, and for that reason you should not overdo this variation, and you should also change legs frequently. It is a challenging variation but one that will give a lot in return, so try not to lose your patience, and don't stop doing it with the proper technique. And we could not ignore the king of rope jumps. If you want to increase your rope jumping speed, you must practice the double unders. Double unders will help you gain ability, agility, and endurance. They are a key step in your path towards mastering technique and increasing speed. !! !We have talked about the technique and training for doing double unders correctly in previous articles, therefore we are not going to repeat that information here, so we will give you a couple of links for those articles.!!! Surely, that with some patience you will master the double unders in a short time. 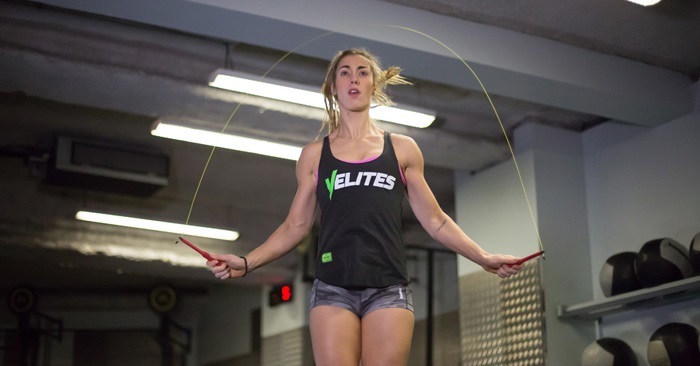 Generally, double unders are the hardest of the 6 jumps we have discussed, besides being the one that requires more ability, endurance, and strength. A good CrossFit workout, for example, frequently includes sets of double unders as a mandatory exercise. An example of a workout to increase your dexterity and speed when rope jumping. A routine we at Vellites Sports go to frequently is the following. Simple jumps:3 sets of 30 seconds. Rest for 15 seconds between sets. Lateral jumps:3 sets of 30 seconds. Rest for 15 seconds between sets. Alternating jumps:3 sets of 30 seconds. Rest for 15 seconds between sets. Lateral alternating jumps:2 sets of 30 seconds. Rest for 15 seconds between sets. Alternating jumps with knees high:2 sets of 20 seconds. Rest for 15 seconds between sets. Single leg jumps:3 sets of 5 seconds with each leg. Rest for 10 seconds between sets. Double unders:2 sets of 10 double unders. Rest for 15 seconds between each set. We hope you considered this information useful, and mostly that you will be able to put it into practice. 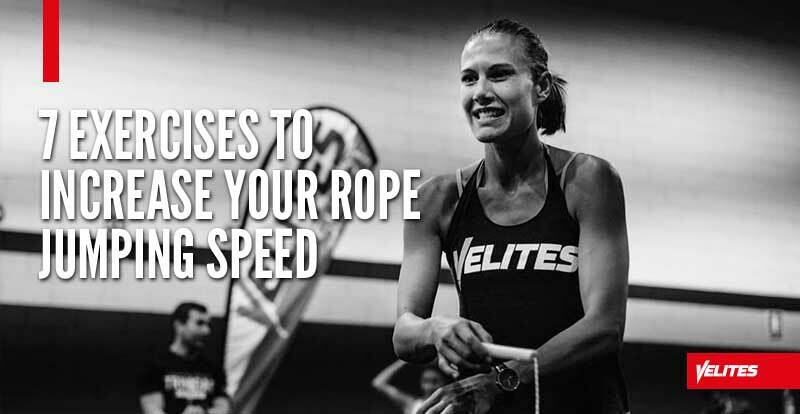 These drills will surely help you increase your speed while rope jumping, but undoubtedly, if you do CrossFit, martial arts, or any other sport, you will also notice some positive results for sure. If you enjoyed this article, please do share it in your social networks. Thank you.